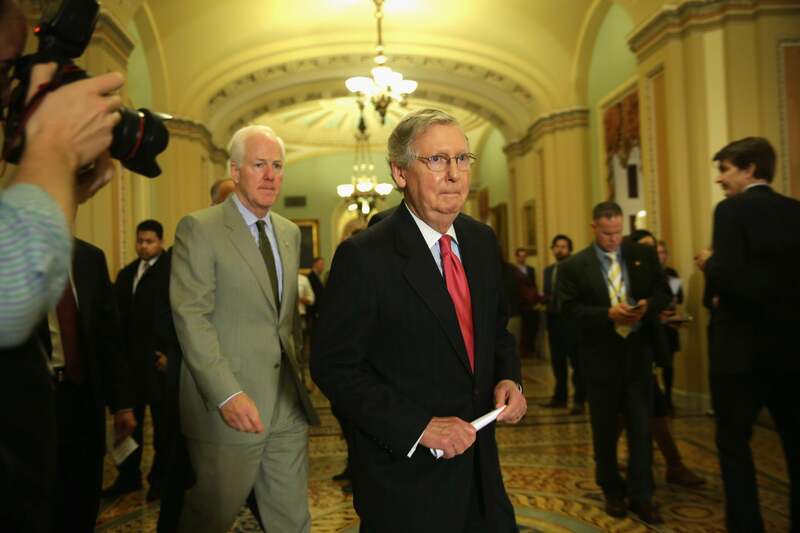 Mitch McConnell and John Cornyn vote to raise debt limit. Here they come to save the daaaaaaay. Anyone who listened to Republican senators yesterday could tell they were unhappy to be stuck with a “clean” debt limit increase. Oh, not that most of them didn’t want to pass it and move on. They did! But it was going to be tough to sell back home. It got tougher after Texas Sen. Ted Cruz, shocking absolutely no one, said he’d demand a cloture vote on the bill, one that would require every Democrat and independent and at least five Republicans to suspend the debt limit through the 2014 election. The minus: See above, re: “five Republicans.” The vote was held open for 45 minutes as Harry Reid struggled to break past 58 votes for passage. Finally, Kentucky Sen. Mitch McConnell and Texas Sen. John Cornyn arrived to vote “aye” and push the bill through. This has been received as a huge risk, by both men. But was it, really? McConnell and Cornyn have both cast plenty of votes to raise the debt limit. If they didn’t do it this time, an opponent could just pull the old file and dust it off. And neither senator’s main primary challenger (respectively: Matt Bevin, Steve Stockman) is scaring him right now. McConnell’s still feeling the vibes from a Politico scoop that revealed Bevin had once supported the effects of TARP.